Evocative stories and themes brought to life as game experiences. Tabletop games are the medium I’m using to tell evocative stories on subjects that matter to me. From futuristic topics like an apocalyptic climate change scenario, to current topics like the broken democracy in the United States, to historical topics like the War of Currents in late 19th century America, I strive to enable joy while conveying rich story and insight. I am a co-host of The Game Design Round Table: over 150 episodes (and counting!) of conversation and analysis by game designers, for game designers. Published in 2016. When designing my historical games I invest dozens, if not hundreds of hours, of research. The ostensible result is lots of interesting content never makes it into the final game. Such was the case when designing Tesla vs. Edison. However, that excess also offered promise: if the game was well-received and commercially successful then there was already lots of good stuff ready to go for an expansion. Happily, the first 8,000 run of Tesla vs. Edison sold out almost immediately and creating the first expansion became a priority. Tesla vs. Edison: Powering Up! brought three new mechanical features to the game universe: an increased emphasis on building your company via customized HQ’s, special rules and turn variety via historical event cards, and a set of two AI decks for each of the six inventors in the Tesla vs. Edison universe so any of the positions can be automated. In addition, prominent among the new content was the introduction of main female characters into the game. The sixth inventor, Madam CJ Walker, was a self-made millionaire in the personal care industry. She is joined by six other female luminaries from the late 19th and early 20th century. Bringing their stories to life is my favourite part of this release. Published in 2016. I’ve been disillusioned with the democratic political process here in the United States since 1992, when I was 18 years old and actively involved in the presidential campaign for Jerry Brown. Whereas the idea of democratic politics is built on equality and power to the people, the reality here in the United States reveals simply another variation on those in power using the system to keep and extend their power. It is a story as old as recorded human history. Having already published a proposal to redesign this system (www.RedesignDemocracy.com) I wanted to use a game to tell the story of this broken system as well. In 2014 my friend Ray Chandler showed me a prototype of a political game he was working on. We decided to take that starting point and together create what became Corrupted Kingdoms. 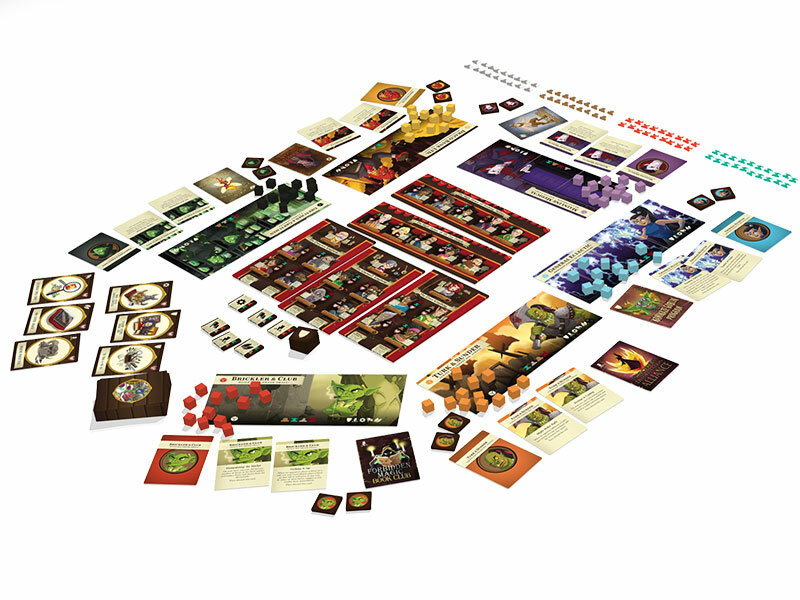 Set in a fantasy world, players take control of a monster corporation that is using evil minions to corrupt the fair senate of the land, pass infernal legislation, and receive ridiculous, unnecessary extravagences as reward for plundering the kingdom. Full of humor and parody it is my lightest game to date. Published in 2015. About five years ago I read a book about the War of Currents and had a game designed in my head by the time I was done. After The Oatmeal turned Tesla into a geek icon I knew there was a market for the game and proceeded to design and publish it. 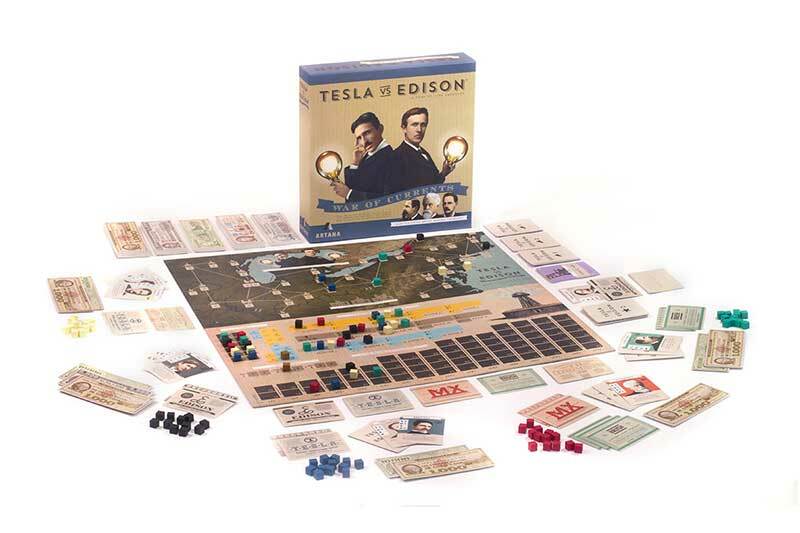 Tesla vs. Edison is a medium-weight strategy game. The key design challenge was integrating all of the major aspects of the War of Currents – competition to win electric projects, a race for technological superiority and patents, vicious propaganda, and a variety of business intrigues and audacious moves by financiers – into an elegant and easy-to-learn system. It really turned out well and the positive feedback has been gratifying. Published in 2015. I got back into gaming about 10 years ago and was taken by the generally mediocre component quality that most modern games had. As someone who likes well-designed and evocative things I started to imagine better, premium components. The first of those that I decided to create were real metal gaming coins. I initially did a single set as an add-on to Road to Enlightenment, leading imitators to offer their own metal coins. This comprehensive system of coins was my more complete follow-up. 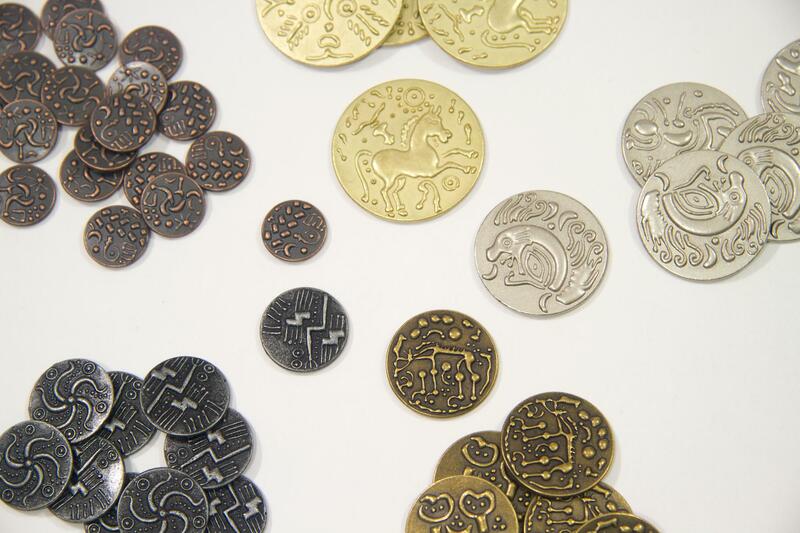 The Best Damn Gaming Coins Ever is a system of metal coins to upgrade games covering a variety of themes. Both in their beautiful art and the inherently higher quality that metal coins add to the gaming experience they further immerse the player into the world offered by the game. The original offering covered 13 different thematic sets with more new designs released each year. Published in 2014. A friend of mine planned to publish two games under the name Pocket Armies through my old game publishing company. After the Kickstarter campaign he experienced personal issues that left the game in a state of disrepair in my lap. Despite my not having any interest in creating this theme of game – World War 2 tactical battles – I had a financial commitment via our supporters to get the game made. So, I redesigned it from the ground-up and published it a year later. 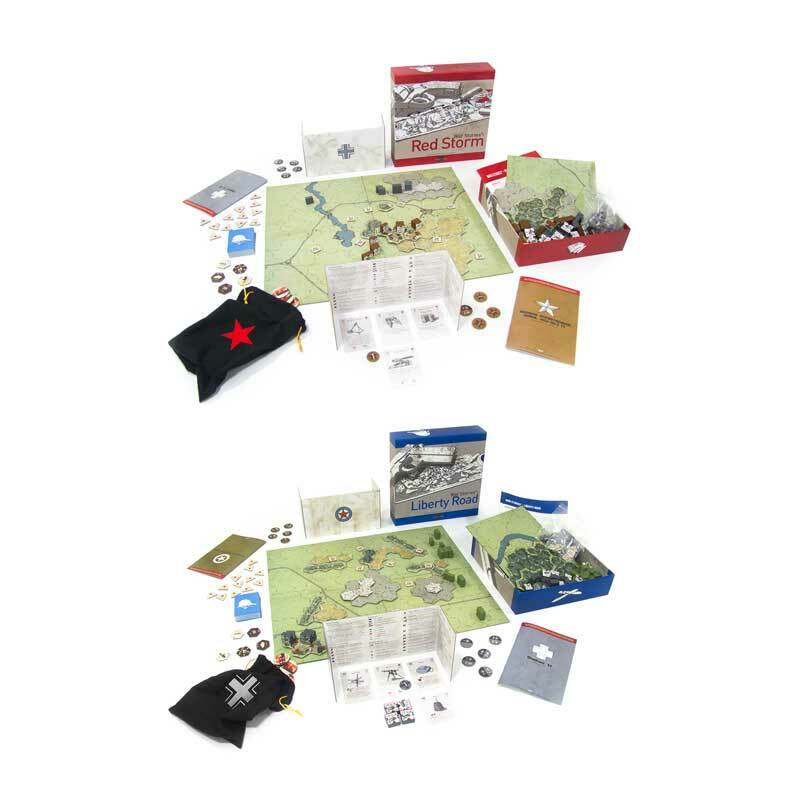 The War Stories games – Red Storm and Liberty Road – offer a unique take on the battlefield experience. While maintaining usability and elegance a scenario is offered that keeps each player as ignorant of one another’s units, objectives, and special equipment as possible. The result is a game experience high on realism and immersion but easier to play than the other highly realistic wargames that it competes with. Published in 2013. The impact of climate change, and particularly doomsday scenarios about its impact on humanity, led me to a future planning exercise. One of the outcomes was an acknowledgement there is a non-zero chance major governments are forced to consider depopulation if the future of our species was ever truly hanging in the balance. While certainly not something that I thought likely, the very idea it seemed possible was chilling. I wanted to communicate this potential peril to others, and make overpopulation a more concrete and well understood thing. Tomorrow is a lightweight, beer-and-pretzels style wargame. Centered around a world map with exactly 100 pawns on it – displaying the roughly proportional population around the world – the game puts players in charge of one of six superpowers – including an Arab Caliphate that presaged the rise of ISIS and the Islamic State. Your goal is to cooperatively depopulate the world while, at the same time, attempting to use your military, espionage, cyber specialists, and nuclear arsenal to gain more political capital that your opoonents and position yourself as the next superpower of this broken world. Published in 2012. 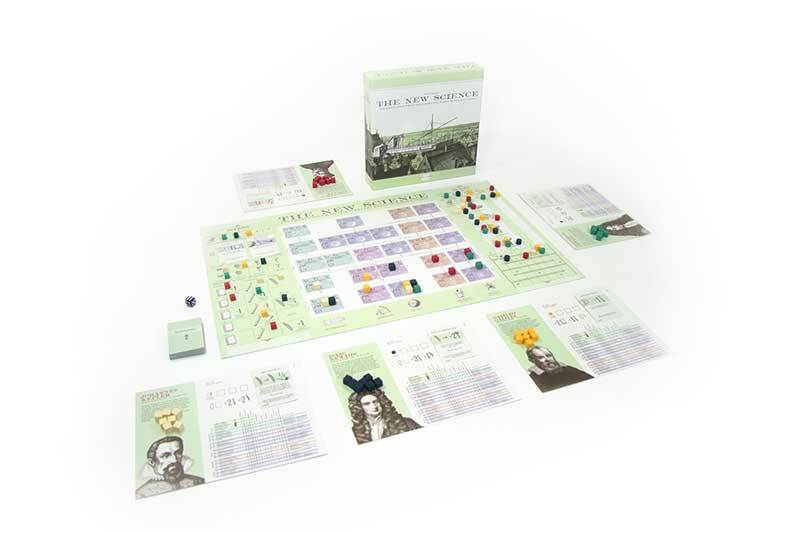 While designing Road to Enlightenment I realized how interesting the scientific revolution was, and that there was not a game designed on the subject. So I designed one! It took less than nine months from my original inspiration to make the game to having the printed box in my hand. While that is a good example of my not understanding the full game development process, it has been my most enjoyed game still selling briskly years after the original release. 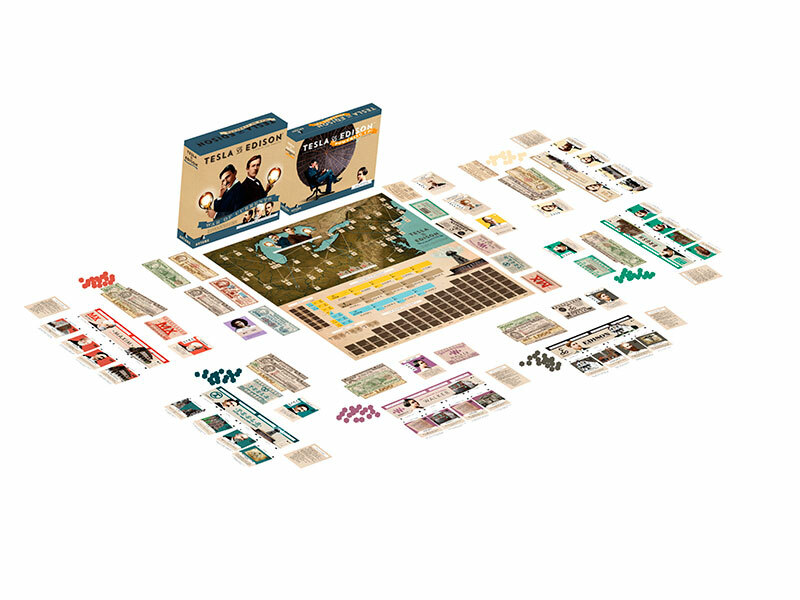 In players become one of five famous scientists from the period. They race to first research, then experiment on, and finally publish about the famous discoveries of the time – all while trying to gain fame with the king, pope, free enterprisers, and the scientific community. 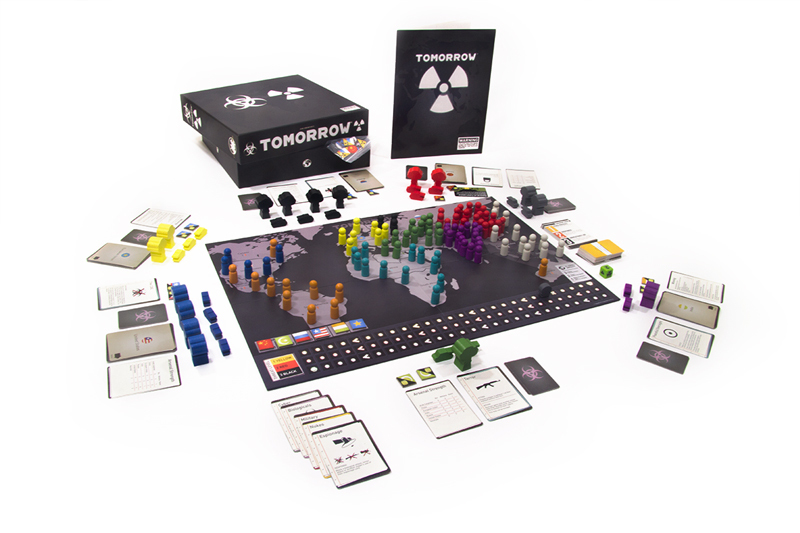 It is a light-to-medium weight game that uses the worker placement mechanic to let the scientists allocate their precious energy each turn. Published in 2011. One morning in 2009 I woke up with the idea for this game and a new hobby in my life was born. The recession was in the process of destroying my Silicon Valley software company; game design gave me a creative outlet and emotional escape. From the time I was a little boy playing strategy games was something I enjoyed. Modifying those games or creating simple games of my own was an informal but natural part of those activities. Road to Enlightenment took that to the next level. 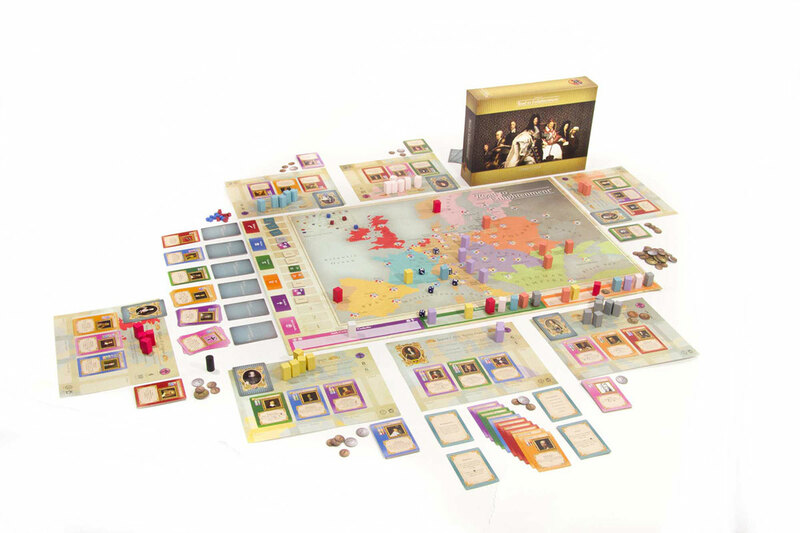 A grand strategic geopolitical game, Road to Enlightenment puts players in the role of a powerful monarch from the 17th or early 18th century. You are competing against up to six other monarchs from across the continent in all of territory control, art, science, and the religious struggle between Catholicism and Protestantism. A feature of the design is almost 150 historical figures from all across Europe individually rated in up to eight categories and each with their own special ability, lovingly designed to try and evoke their historical contribution.